Oh my…we need a little warmth and sunshine here in Ohio today! IT…IS…FREEZING…OUT…THERE! No seriously! I hate winter…I really and truly HATE winter! So I have a wonderfully happy card for you today (and tomorrow…it’s Tour de Freaks time!) I decided to use this fun print as my inspiration for the card. It is such a cool sketch this week. My card is a little ‘thinner’ so my butterfly can hang over the edge and still fit in a regular sized envelope! Tulip print (Painted Blooms dsp) – 3 3/4 x 4 3/4. The right side is 3 3/4. Cut on the diagonal and add to card front. Add piece of Blackberry Bliss Stitched Satin Ribbon to the card. Cut medium butterfly from Rose Red cardstock and add to card front – hanging over the left side edge some. Add Basic Rhinestones to the body of the butterfly and some on the dsp. I like the idea of narrowing the card so the butterfly can hang over. Beautiful card, Mary. And I agree with you about winter. Yuck!! Beautiful paper, butterfly and card! Love the spring-y look even if we are forecast for more winter weather! ugh! This card would cheer anyone up with thoughts of spring! I hear ya, Mary – I WANT SPRING! lol! But your card is the closest thing to it right now, so I will just sit and enjoy it! It’s so cold here too Mary, I want to move! Love how you used the designer paper and coordinated butterfly! 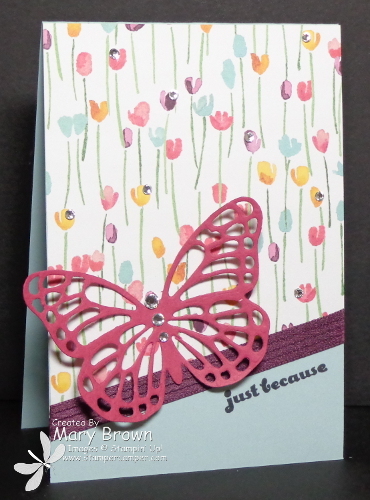 Love this butterfly floating over that gorgeous flower DSP – neat idea to narrow the card so that it could overhang too. This card tells me Spring must be on the way! Gorgeous!! I love the butterfly perched on the ribbon. It matches beautifully with the dsp! Love that butterfly! What a pretty card with the beautiful soft colors! I’m ready for spring! !